I love thrift stores. I love finding treasures to call my own, I love the low prices and I love giving my money where it might be used to better the community. 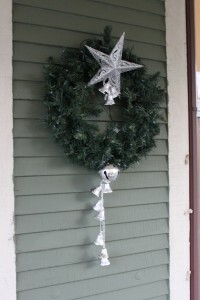 So, this season, when I saw the MASS of wreaths hanging out at the local thrift shops, I had to buy (at least) one. So, after a trip to the dollar store to spruce it up- I ended up with a LOVELY wreath. 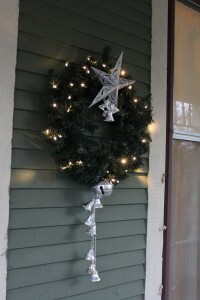 After purchasing the wreath ($3.00), I headed off to the Dollar Store and I picked up a string of plastic silver bells, a large silver jingle bell, and a large glittered star (additional $3.00). 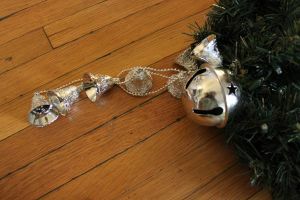 I cut off a length of the silver bells and fiddled with them until they hung in a pleasing way. 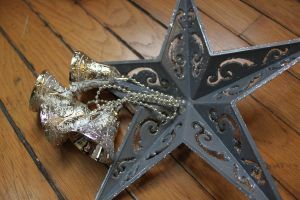 Then I glued them to the back of the glittered star using hot glue. 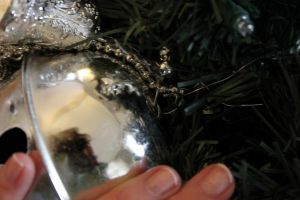 Similarly, I cut off another length of the bells and used wire to attach them to the large jingle bell. One the glue was sufficiently cooled, I used a light gauge silver wire to fasten the large jingle bell (with plastic bells attached) to the bottom portion of the wreath. 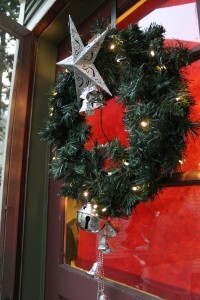 I then used another length of wire to secure the large star to the top of the wreath. Voila! Here are the results. The whole transformation took max 15 minutes. Pretty great for $6.00! I did attempt to incorporate a bow made with my bowdabra- but it ended up just looking like too much on the wreath at once.